We strive to develop high-quality products that will satisfy customers based on our commitment to deliver additive-free formulations. The Faith Group’s ongoing commitment to safe, additive-free cosmetics derives from a 1977 lawsuit involving cosmetics that turned customers’ skin black, despite the fact they intended to become more beautiful by using those products. In order to develop cosmetics that not only are safe, but also satisfy customers, we incorporate the latest technologies and ingredients while reflecting the trends of the times and customer needs. Faith cosmetics are based on a gel that is the same as substances such as hyaluronic acid, which nourishes the dermis. 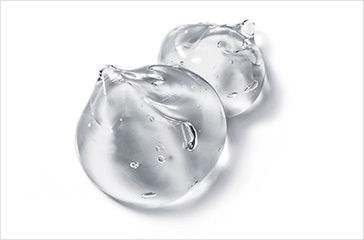 Gel formulations offer excellent stability and safety as a base for cosmetics. In addition to the ability to carry large quantities of water-soluble active ingredients, they can transport a reasonable quantity of oil-soluble ingredients without the need to use synthetic surfactants (*1). 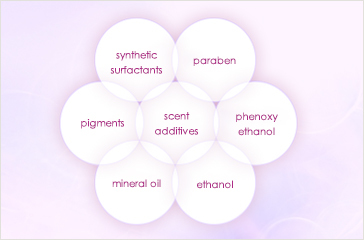 Our products never contain synthetic surfactants, paraben, phenoxyethanol, ethanol (*2), mineral oil, pigments, or scent additives. Reflecting our belief that formulating the cosmetics that come into direct contact with the skin using natural substances that have been a familiar ingredient since ancient times is the most comfortable and safest approach for people, we are committed to using naturally derived ingredients in our products. Surfactants are an essential part of creating cosmetics, but synthetic surfactants have powerful effects and may cause issues such as skin irritation. Although we use some synthetic ingredients, each is subjected to an in-house test known as K.S.A. We use only those ingredients for which we are unable to measure generation of active oxygen with this test. Faith is grateful to Doshisha University professor emeritus Hajime Nishioka, who developed this method. All ingredients used in our cosmetics are listed on the product, for example on the side of the box or on the sample card. This information can facilitate more precise judgments by physicians investigating which ingredients are to blame for allergic reactions. Patients can stop using products that they conclude may damage their skin, for example by causing an allergic reaction, based on information from physicians. We offer comprehensive support for product development as well as subsequent sales strategies. We work with companies that share the Faith Group’s commitment to cosmetics and invite them to add their own philosophy to our own by developing cosmetics that will drive those companies’ competitiveness in the future because they are differentiated from standard products. With a variety of cosmetics available for purchase at low prices in supermarkets and drugstores, the market demands products that customers find compelling and that companies can use to differentiate themselves from competitors. Our customers have praised private-label products for their profitability since these original, in-house offerings do eliminate the need for distribution middle-men. We offer comprehensive support for product development as well as subsequent sales strategies. In addition to cosmetics, we manufacture hair care and body care products, as well as health foods. *2 Except ethanol used to produce extracts.